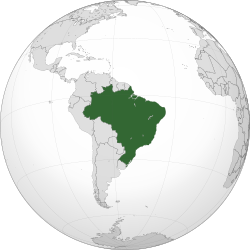 Coordinates: 10°S 52°W﻿ / ﻿10°S 52°W﻿ / -10; -52 in South America (grey) Brazil (Portuguese: Brasil Portuguese pronunciation: ), officially the Federative Republic of Brazil (Portuguese: República Federativa do Brasil, listen (help·info)), is the largest country in both South America and Latin America. At 8.5 million square kilometers (3.2 million square miles) and with over 208 million people, Brazil is the world's fifth-largest country by area and the fifth most populous. Brazil borders every South American country except Chile and Ecuador. Its capital is Brasília, and its most populated city is São Paulo. The federation is composed of the union of the 26 states, the Federal District, and the 5,570 municipalities. It is the largest country to have Portuguese as an official language and the only one in the Americas; it is also one of the most multicultural and ethnically diverse nations, due to over a century of mass immigration from around the world. Flag anthem: "Hino à Bandeira Nacional"
Brazil (Portuguese: Brasil Portuguese pronunciation: [bɾaˈziw]),[nt 1] officially the Federative Republic of Brazil (Portuguese: República Federativa do Brasil, listen (help·info)), is the largest country in both South America and Latin America. At 8.5 million square kilometers (3.2 million square miles) and with over 208 million people, Brazil is the world's fifth-largest country by area and the fifth most populous. Brazil borders every South American country except Chile and Ecuador. Its capital is Brasília, and its most populated city is São Paulo. The federation is composed of the union of the 26 states, the Federal District, and the 5,570 municipalities. It is the largest country to have Portuguese as an official language and the only one in the Americas; it is also one of the most multicultural and ethnically diverse nations, due to over a century of mass immigration from around the world. Brazil is considered an advanced emerging economy. It has the eighth largest GDP in the world by both nominal and PPP measures. It is one of the world's major breadbaskets, being the largest producer of coffee for the last 150 years. It is classified as an upper-middle income economy by the World Bank and a newly industrialized country, with the largest share of global wealth in Latin America. Brazil is a regional power and sometimes considered a great or a middle power in international affairs. On account of its international recognition and influence, the country is subsequently classified as an emerging power and a potential superpower by several analysts. Brazil is a founding member of the United Nations, the G20, BRICS, Union of South American Nations, Mercosul, Organization of American States, Organization of Ibero-American States and the Community of Portuguese Language Countries. 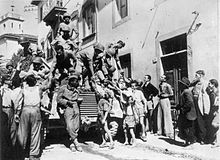 Soldiers of the Brazilian Expeditionary Force greet Italian civilians in Massarosa, during World War II. Pico da Neblina, Amazonas, part of the Guiana Shield and the highest peak in Brazil, 2,995.3 metres (9,827 ft) above sea level. Brazil is the largest national economy in Latin America, the world's eighth largest economy and the eighth largest in purchasing power parity (PPP) according to the 2017 estimates. Brazil has a mixed economy with abundant natural resources. After rapid growth in preceding decades, the country entered an ongoing recession in 2014 amid a political corruption scandal and nationwide protests. Former President Dilma Rousseff at Jornal Nacional news program. Rede Globo is the second largest commercial television network of the world. The Brazilian press had its beginnings in 1808 with the arrival of the Portuguese royal family to Brazil, hitherto forbidden any activity of the press – was the publication of newspapers or books. 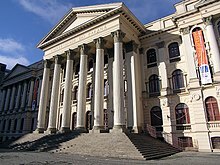 The Brazilian press was officially born in Rio de Janeiro on 13 May 1808, with the creation of the Royal Printing, National Press by the Prince Regent Dom João. ↑ Exército Brasileiro. "Hino à Bandeira Nacional" (in Portuguese). Archived from the original on 22 February 2014. Retrieved 29 January 2014. ↑ "Demographics". Brazilian Government. Archived from the original on 17 November 2011. Retrieved 8 October 2011. ↑ "Caracteristicas da População e dos Domicílios do Censo Demográfico 2010 – Cor ou raça" (PDF). Retrieved 7 April 2012. ↑ IBGE – Instituto Brasileiro de Geografia e Estatística (Brazilian Institute for Geography and Statistics). 2010 Census. Retrieved 7 August 2012. ↑ Silva, Antonio Carlos Coutinho Gouvea da. "Projeções da População | Estatísticas | IBGE :: Instituto Brasileiro de Geografia e Estatística". www.ibge.gov.br (in Portuguese). Retrieved 30 August 2018. 1 2 3 4 "Report for Selected Countries and Subjects". www.imf.org. International Monetary Fund. Retrieved 1 January 2019. 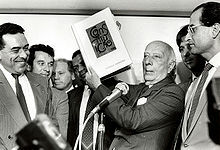 ↑ José María Bello (1966). 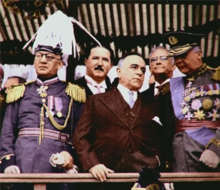 A History of Modern Brazil: 1889–1964. Stanford University Press. p. 56. ISBN 978-0-8047-0238-6. 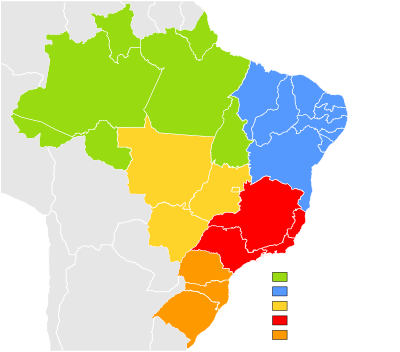 ↑ "Área Territorial Brasileira" [Brazilian Territorial Area] (in Portuguese). 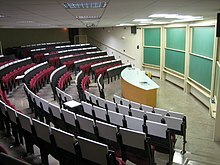 Instituto Brasileiro de Geografia e Estatística. Retrieved 4 May 2018. Para a superfície do Brasil foi obtido o valor de 8.515.759,090 km2, publicado no DOU nº 124 de 30/06/2017, conforme Resolução Nº 02, de 29 de junho de 2017. ↑ Philander, S. George (2012). Encyclopedia of Global Warming and Climate Change, Second Edition. Vol. 1 (Second ed.). Los Angeles: Princeton University. p. 148. ISBN 978-1-4129-9261-9. OCLC 970592418. ↑ Vallance, Monique M. (2012). "Preface and Observations on Contemporary Brazil". In Crocitti, John J. Brazil Today: An Encyclopedia of Life in the Republic. Contributing editor Monique M. Vallance. ABC-CLIO. p. xxiii. ISBN 978-0-313-34672-9. OCLC 787850982. ↑ "Os migrantes de hoje". BBC Brasil. Retrieved 24 October 2018. 1 2 3 4 5 6 7 8 "Geography of Brazil". The World Factbook. Central Intelligence Agency. 1 May 2018. Geography > Coastline. Retrieved 4 May 2018. ↑ "Brazil – Land". Permanent Missions. United Nations. Geography. Archived from the original on 23 October 2014. ↑ "UNESCO World Heritage Centre — World Heritage List". UNESCO. Retrieved 25 May 2012. ↑ "FTSE Country Classification" (PDF). FTSE Group. September 2018. Retrieved 20 November 2018. ↑ "CIA – The World Factbook – Country Comparisons – GDP (purchasing power parity)". Cia.gov. Retrieved 25 January 2011. 1 2 Jeff Neilson; Bill Pritchard (2011). Value Chain Struggles. John Wiley & Sons. p. 102. ISBN 978-1-4443-5544-4. ↑ Paweł Bożyk (2006). "Newly Industrialized Countries". Globalization and the Transformation of Foreign Economic Policy. Ashgate Publishing. p. 164. ISBN 978-0-7546-4638-9. ↑ Mauro F. Guillén (2003). "Multinationals, Ideology, and Organized Labor". The Limits of Convergence. Princeton University Press. p. 126 (table 5.1). ISBN 978-0-691-11633-4. ↑ M. Schaefer; J. Poffenbarger (2014). The Formation of the BRICS and its Implication for the United States: Emerging Together. Springer. p. 32. ISBN 978-1-137-38794-3. 1 2 Gardini, Gian Luca (2016). "Brazil: What Rise of What Power?". Bulletin of Latin American Research. 35: 5–19. doi:10.1111/blar.12417. 1 2 Sean W. Burges (2016). Latin America and the Shifting Sands of Globalization. Routledge. pp. 114–15. ISBN 978-1-317-69658-2. ↑ "Especialistas reclamam reconhecimento do Brasil como potência mundial". IBS News. 15 June 2011. Retrieved 7 April 2017. ↑ "Pela primeira vez Brasil emerge como potência internacional, diz Patriota". 10 May 2012. Retrieved 7 April 2017. ↑ "Brazil – Emerging Soft Power of the World". allAfrica.com. 15 September 2011. Retrieved 7 April 2017. ↑ "Brasil ganha dos Estados Unidos em influência na América do Sul". The Economist. 2 September 2011. Retrieved 7 April 2017. ↑ Peter Collecott (29 October 2011). "Brazil's Quest for Superpower Status". The Diplomatic Courier. Retrieved 10 August 2014. ↑ Clendenning, Alan (17 April 2008). "Booming Brazil could be world power soon". USA Today. The Associated Press. p. 2. Retrieved 12 December 2008. ↑ Jorge Dominguez; Byung Kook Kim (2013). Between Compliance and Conflict: East Asia Latin America and the New Pax Americana. Center for International Affairs, Harvard University. pp. 98–99. ISBN 978-1-136-76983-2. ↑ Fausto, Boris (1999). A Concise History of Brazil. Cambridge University Press. p. 9. ISBN 978-0-521-56526-4. ↑ Jon S. Vincent. (2003). Culture and Customs of Brazil. Greenwood Publishing Group. p. 36. ISBN 978-0-313-30495-8. ↑ Richard P. Tucker (2007). Insatiable Appetite: The Ecological Degradation of the Tropical World. University of Michigan. p. 186. ISBN 978-0-7425-5365-1. ↑ Wayne E. Lee (2011). Empires and Indigenes: Intercultural Alliance, Imperial Expansion, and Warfare in the Early Modern World. NYU Press. p. 196. ISBN 978-0-8147-6527-2. ↑ Bonnier Corporation (1880). Popular Science. Bonnier Corporation. p. 493. ISSN 0161-7370. ↑ Jean de Léry (1990). History of a Voyage to the Land of Brazil, Otherwise Called America. University of California Press. p. 242. ISBN 978-0-520-91380-6. ↑ Jayme A. Sokolow. (2003). The Great Encounter: Native Peoples and European Settlers in the Americas, 1492–1800. M.E. Sharpe. p. 84. ISBN 978-0-7656-0982-3. ↑ Maria Herrera-Sobek (2012). Celebrating Latino Folklore. ABC-CLIO. p. 155. ISBN 978-0-313-34340-7. ↑ Romero, Simon (27 March 2014). "Discoveries Challenge Beliefs on Humans' Arrival in the Americas". New York Times. Retrieved 31 May 2014. ↑ Robert M. Levine; John J. Crocitti (1999). The Brazil Reader: History, Culture, Politics. Duke University Press. pp. 11–. ISBN 978-0-8223-2290-0. Retrieved 12 December 2012. ↑ Mann, Charles C. (2006) . 1491: New Revelations of the Americas Before Columbus. Vintage Books. pp. 326–33. ISBN 978-1-4000-3205-1. ↑ Levine, Robert M. (2003). The History of Brazil. Palgrave Macmillan. p. 32. ISBN 978-1-4039-6255-3. ↑ Levine (2003), p. 31. 1 2 Fausto, Carlos (2000). Zahar, Jorge, ed. Os Índios antes do Brasil [The Indians before Brazil] (in Portuguese). pp. 45–46, 55. ISBN 978-85-7110-543-0. ↑ Fausto (2000), pp. 78–80. ↑ Fausto (2000), p. 50. 1 2 Boxer, p. 100. ↑ Crocitti & Vallance (2012). ↑ Kohn, George C. (1986). Dictionary of Wars (1st ed.). Facts on File, Inc. p. 174. ISBN 978-1-4381-2916-7. ↑ George Richard Potter; Henry Clifford Darby; Harold Fullard (1957). The New Cambridge Modern History. 3 (1st ed.). CUP Archive. p. 498. 1 2 Jeffrey C. Mosher (2008). Political Struggle, Ideology, and State Building: Pernambuco and the Construction of Brazil, 1817–1850. U of Nebraska Press. p. 9. ISBN 978-0-8032-3247-1. ↑ Jeremy Adelman (2006). 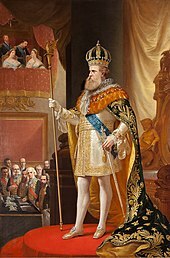 Sovereignty and Revolution in the Iberian Atlantic. Princeton University Press. pp. 334–. ISBN 978-0-691-12664-7. ↑ Fausto (1999), pp. 82–83. ↑ Fausto (1999), Chapter 2, 2.1 to 2.3. ↑ Scott, Rebecca and others, The Abolition of Slavery and the Aftermath of Emancipation in Brazil, Duke University Press 1988 ISBN 0-8223-0888-6 Seymour Drescher, Chap. 2: "Brazilian Abolition in Comparative Perspective"
↑ Fausto (1999), Chapter 2, p. 83, and 2.6 "The Paraguayan War". ↑ Smallman, Shawn C. (2002). "The Overthrow of the Empire". Fear in Memory in the Brazilian Army and Society. University of North Carolina Press. pp. 16–18. ISBN 978-0-8078-5359-7. ↑ "Brazil's Proclamation of the Republic through the press". The Brazilian Report. 15 November 2017. Retrieved 13 November 2018. ↑ Smallman (2002), end of Chapter 1, from p. 18 "Military rule". ↑ Smallman (2002), pp. 21–26. ↑ Frank M. Colby, Allen L. Churchill, Herbert T. Wade & Frank H. Vizetelly; The New international year book Dodd, Mead & Co. 1989, p. 102 "The Fascist Revolt"
↑ Gaspari, A Ditadura Envergonhada, pp. 141–42. ↑ Gaspari, A Ditadura Envergonhada, p. 35. ↑ Crocitti & Vallance (2012), p. 395, last paragraph. ↑ Crocitti & Vallance (2012), p. 396. ↑ Crocitti & Vallance (2012), p. 395–97. 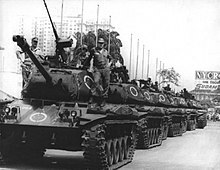 ↑ Fausto (1999), Chapter 6 "The military government and the transition to democracy (1964–1984)". ↑ Fausto (2005), pp. 464–65. ↑ Fausto (2005), pp. 465, 475. ↑ Fausto (2005), p. 482. ↑ Fausto (2005), p. 474. ↑ Fausto (2005), p. 502. ↑ "Global protest grows as citizens lose faith in politics and the State" article on "the Guardian"
↑ Zirin, 2014. Chapter 7 & Conclusion. ↑ Article at The New York Times, 19 April 2016, On the Brazilian political context that led to the approval of impeachment proceedings against Dilma Rousseff. ↑ Article at Reuters on the involvement of Brazilian politicians in tax evasion schemes unveiled by the Panama Papers. 4 April 2016. ↑ Article at Financial Times (18 April 2016) about the political ambience in Brazil on the day vote for the Deputies chamber decision about open an impeachment procedure against president Dilma. 2nd to 4th paragraph. ↑ Jonathan Watts & Donna Bowater. "Dilma Rousseff impeached by Brazilian senate". The Guardian. Retrieved 31 August 2016. ↑ Article of New York Times about the denouement of Roussef's impeachment process. ↑ "Brazil supreme court judge orders probe into nine ministers – paper". Reuters. 11 April 2017. ↑ "President Michel Temer of Brazil Is Charged With Corruption". The New York Times. 26 June 2017. ↑ "A scary election in Brazil". The Economist. Retrieved 1 October 2018. ↑ "Hora Legal Brasileira". Observatório Nacional. Archived from the original on 22 July 2011. Retrieved 28 December 2014. 1 2 3 4 5 "Brazil". Country Guide. BBC Weather. Archived from the original on 8 February 2011. Retrieved 11 June 2008. 1 2 3 "Temperature in Brazil". Brazil Travel. Retrieved 11 June 2008. 1 2 Embrapa. "Annual averages of Mandacaru Agro-meteorological station" (in Portuguese). Archived from the original on 20 August 2007. Retrieved 21 October 2008. ↑ "CPD: South America, Site SA19, Caatinga of North-eastern Brazil, Brazil". Botany.si.edu. Archived from the original on 6 June 2009. Retrieved 29 October 2009. ↑ "Drought, Smallpox, and Emergence of Leishmania braziliensis in Northeastern Brazil." Centers for Disease Control and Prevention (CDC). ↑ "Ó Gráda, C.: Famine: A Short History Archived 12 January 2016 at the Wayback Machine." Princeton University Press. ↑ "Inland fishery enhancements." FAO. 1 2 "One fifth of the world's freshwater". Amazon. World Wide Fund for Nature. 6 August 2007. Retrieved 12 June 2008. 1 2 3 4 "Plant and Animal Life". Encarta. MSN. Archived from the original on 31 October 2009. Retrieved 12 June 2008. ↑ "Atlantic Forest, Brazil". Map: Biodiversity hotspots. BBC News. 1 October 2004. Retrieved 12 June 2008. 1 2 "Environmental Issues". Encarta. MSN. Archived from the original on 31 October 2009. Retrieved 12 June 2008. ↑ "Under threat". Greenpeace. Retrieved 12 June 2008. ↑ "Amazon destruction: six football fields a minute". Greenpeace. Archived from the original on 5 April 2008. Retrieved 12 June 2008. ↑ "Brazil grants environmental licence for Belo Monte dam." BBC News. 2 February 2010. ↑ "Democracy Index 2010" (PDF). eiu.com. Retrieved 12 February 2016. ↑ Fontaine, Edward (1872). "Contributions to the Physical Geography of the Mississippi River, and Its Delta". Journal of the American Geographical Society of New York. 3: 343–78. doi:10.2307/196424. ISSN 1536-0407. JSTOR 196424 – via JSTOR. (Registration required (help)). ↑ "Government – Brazil". Southtravels.com. 5 October 1988. Archived from the original on 28 November 2011. Retrieved 17 March 2010. ↑ "The Brazilian Legal System", Organization of American States. Retrieved 17 May 2007. ↑ José Afonso da Silva, Curso de Direito Constitucional Positivo (Malheiros, 2004; ISBN 85-7420-559-1), p. 46. ↑ Silva, Curso de Direito Constitucional Positivo, p. 592. ↑ Fabiano Deffenti; Welber Oliveira Barral (2011). Introduction to Brazilian Law. Kluwer Law International. pp. 20–. ISBN 978-90-411-2506-4. Retrieved 6 June 2013. ↑ Miguel Glugoski and Odete Medauar, "Nossos direitos nas suas mãos," USP Journal, 24–30 November 2003. Retrieved 17 May 2007. ↑ Diego Abreu, "Primeira Corte do mundo a ter canal de vídeo no YouTube é o STF," G1. (in Portuguese) Accessed 12 October 2009. ↑ "STF: Primeira corte do mundo no YouTube." ESMA-PB. (in Portuguese) Accessed 12 October 2009. ↑ "Página do STF no Twitter está no ar" (12 January 2009). STF Official Website. (in Portuguese) Consulted on 5 December 2009. ↑ Uma Nova Agenda Militar Archived 25 March 2017 at the Wayback Machine Revista Época. Retrieved on 19 February 2009. ↑ "Decreto Nº 5.670 de 10 de Janeiro de 2006" (in Portuguese). Presidência da República. Retrieved 2 October 2010. 1 2 "Military Power". Brasil. Retrieved 27 June 2010. ↑ Exército (ed.). "Brigada de Operações Especiais". Archived from the original on 23 September 2013. Retrieved 21 September 2013. ↑ "Defesanet – Brigada de operações especiais". Retrieved 27 June 2010. ↑ "Brigada de Operações Especiais – Bda Op Esp". tropaselite.t35.com. Archived from the original on 28 October 2010. Retrieved 27 June 2010. ↑ "Military Power". Brasil. Retrieved 27 June 2010. ↑ "Brigada de Infantaria Pára-quedista". Exército. Retrieved 21 September 2013. ↑ "1º Batalhão de Infantaria de Selva (Aeromóvel)". Exército. Retrieved 27 June 2010. ↑ "12º Brigada de Infantaria Leve (Aeromóvel)". Brasil: Exército. Retrieved 27 June 2010. ↑ "Força de Ação Rápida – FAR". tropaselite.t35.com. Archived from the original on 18 October 2010. Retrieved 27 June 2010. ↑ Scheina (1987), p. 81. ↑ "Grupamento de Mergulhadores de Combate – GruMeC". tropaselite.t35.com. Archived from the original on 27 March 2010. Retrieved 27 June 2010. ↑ "More asked questions". Marinha. Archived from the original on 14 July 2007. Retrieved 16 August 2007. ↑ "Sala de imprensa – FAB em números" (in Portuguese). Força Aérea Brasileira. Archived from the original on 17 June 2008. Retrieved 12 December 2007. ↑ "Especial – NOTÍCIAS – Uma nova agenda militar". Revistaepoca.globo.com. Retrieved 19 June 2010. ↑ "CIA – The World Factbook". Cia.gov. Retrieved 2 October 2013. ↑ "People's Daily Online – Bolivia bans Argentina from reselling gas to Chile". English.peopledaily.com.cn. 25 October 2006. Retrieved 19 June 2010. ↑ "Fresh anger over Bolivia gas plan". BBC News. 16 April 2004. Retrieved 1 April 2010. ↑ "Especial – NOTÍCIAS – Os pés de barro de um gigante". Revistaepoca.globo.com. Archived from the original on 25 August 2010. Retrieved 19 June 2010. ↑ Rohter, Larry (1 August 2004). "Brazil Is Leading a Largely South American Mission to Haiti". The New York Times. Retrieved 1 April 2010. ↑ "Brazil to Join UN Mission in Central African Republic, MINUSCA". International Policy Digest. 14 December 2017. Retrieved 28 November 2018. ↑ Article 4 of the Federal Constitution of Brazil V-Brazil. Retrieved on 20 September 2011. ↑ Article 84 of the Federal Constitution of Brazil V-Brazil. Retrieved on 20 September 2011. ↑ U.S. Congressional Report on Brazil United States Congress. Retrieved on 23 June 2009. ↑ "Ordem pública é prioridade da Força Nacional de Segurança". Portal Brasil. 29 April 2012. Retrieved 8 February 2015. ↑ "Brasil tem maior número absoluto de homicídios do mundo". O Estado de S. Paulo. 10 December 2014. ↑ "Taxa de delito por 100 mil habitantes". Secretaria de Segurança Pública do Estado de São Paulo. 31 January 2011. Archived from the original on 23 August 2011. Retrieved 14 February 2011. ↑ "Os estados com mais homicídios no Brasil". Exame. 11 November 2014. Retrieved 5 February 2015. ↑ "Brasil passa a Rússia e tem a terceira maior população carcerária do mundo". Folha de S.Paulo. 5 June 2014. ↑ "Brasil tem hoje deficit de 200 mil vagas no sistema prisional". G1. 15 January 2014. Retrieved 21 March 2014. ↑ "Brazil". International Monetary Fund (IMF). Retrieved 1 April 2016. ↑ "Economy of Brazil". The World Factbook. Central Intelligence Agency. 2008. Retrieved 3 June 2008. ↑ O'Neill, Jim. "BRICs". Goldman Sachs. Retrieved 6 June 2008. ↑ "Brasil será maior exportador agrícola mundial em 2024" (in Portuguese). EXAME. 1 July 2015. Retrieved 9 May 2018. ↑ "Embraer vê clientes mais dispostos à compra de aviões". Exame Magazine. Retrieved 8 February 2014. ↑ Alok Bansal; Yogeshwari Phatak; I C Gupta; Rajendra Jain (2009). Transcending Horizons Through Innovative Global Practices. Excel Books. p. 29. ISBN 978-81-7446-708-9. 1 2 "Field Listing – GDP – composition by sector". The World Factbook. Central Intelligence Agency. 2008. Retrieved 9 June 2008. ↑ Steve Luck (1998). The American Desk Encyclopedia. Oxford University Press. p. 121. ISBN 978-0-19-521465-9. ↑ Paolo Maria Giordano; Francesco Lanzafame; Jörg Meyer-Stamer (2005). Asymmetries in Regional Integration And Local Development. IDB. p. 129. ISBN 978-1-59782-004-2. ↑ Gasnier, Mat (15 January 2012). "The 20 biggest car markets in the world: Russia on the up!". Best Selling Cars. Retrieved 17 November 2014. ↑ "The economy of heat". The Economist. 12 April 2007. Retrieved 6 June 2008. ↑ Baig, Taimur; Goldfajn, Ilan (2000). "The Russian default and the contagion to Brazil" (PDF). IMF Working Paper. International Monetary Fund. Retrieved 6 June 2008. ↑ "Os impasses da política econômica brasileira nos anos 90". Revista FAAP. 2010. Retrieved 4 February 2015. ↑ Fraga, Arminio (2000). Monetary Policy During the Transition to a Floating Exchange Rate: Brazil's Recent Experience. International Monetary Fund. Retrieved 6 June 2008. ↑ Wheatley, Jonathan (2 September 2002). "Brazil: When an IMF Bailout Is Not Enough". Business Week. Retrieved 6 June 2008. ↑ "Brazil to pay off IMF debts early". BBC News. 14 December 2005. Retrieved 6 June 2008. ↑ Economic Quarterly (PDF). Institute of Applied Economic Research. 1 March 2007. p. 171. Retrieved 6 June 2008. ↑ "Capital Flows to Emerging Markets Set at Close to Record Levels" (Press release). The Institute of International Finance. 31 May 2007. Archived from the original on 13 July 2011. Retrieved 6 June 2008. ↑ IPCA, IPC-FIPE and IPC-BR: Methodological and Empirical Differences (PDF). Central Bank of Brazil. 2004. Retrieved 6 June 2008. ↑ "Statistics on Mergers & Acquisitions (M&A) – M&A Courses | Company Valuation Courses | Mergers & Acquisitions Courses". Imaa-institute.org. Archived from the original on 6 January 2012. Retrieved 16 April 2011. ↑ "Brazil: Corruption Costs $41 Billion". Latin Business Chronicle. Archived from the original on 21 March 2013. Retrieved 22 March 2013. ↑ "Exposing corrupt politicians? the effect of Brazil's publicly released audits on electoral outcomes" (PDF). Quarterly Journal of Economics. May 2008. Retrieved 22 March 2013. ↑ "Corruption perceptions index". Transparency International. Retrieved 22 March 2013. ↑ "Rousseff Crisis Spurred by Lula Debts as Brazil Boom Diminishes". Mobile.bloomberg.com. 27 September 2011. Archived from the original on 8 May 2012. Retrieved 7 April 2012. ↑ Michael Schmidt; Vincent Onyango; Dmytro Palekhov (2011). Implementing Environmental and Resource Management. Springer. p. 42. ISBN 978-3-540-77568-3. ↑ OECD; Organisation for Economic Co-operation and Development; Organisation for Economic Co-Operation and Development Staff (2001). OECD Economic Surveys: Brazil 2001. OECD Publishing. p. 193. ISBN 978-92-64-19141-9. ↑ Lael Brainard; Leonardo Martinez-Diaz (2009). Brazil As an Economic Superpower? : Understanding Brazil's Changing Role in the Global Economy. Brookings Institution Press. p. 45. ISBN 978-0-8157-0365-5. ↑ OECD (2005). Economic Surveys: Brazil. OECD Publishing. p. 105. ISBN 978-92-64-00749-9. ↑ O Globo (18 March 2014). "Praia de Fernando de Noronha é eleita a mais bonita do mundo". Retrieved 4 January 2018. ↑ UNWTO Tourism Highlights. 2016. doi:10.18111/9789284418145. ISBN 978-92-844-1814-5. 1 2 "UNWTO Tourism Highlights – 2011 Edition" (PDF). World Tourism Organization. June 2011. Retrieved 29 September 2011. 1 2 "Estatisticas e Indicadores: Receita Cambial" (in Portuguese). Ministério do Turismo. 2012. Retrieved 13 February 2012. 1 2 Ministério do Turismo (13 January 2012). 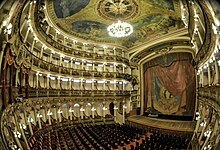 "Turismo Brasileiro com novo recorde em 2011" (in Portuguese). No Pátio. Archived from the original on 22 August 2013. Retrieved 13 February 2012.